We’re halfway through Non-Fiction November already and my good intentions of celebrating my favourite non-fic titles have been scuppered by work, travel and colds! We’re still in November, so all is well. But then I think to myself, non-fiction is fantastic, and should be promoted and celebrated all year round! In some respects it makes me sad to see so much more non-fic on social media just during November, and see it dry up in following months. Non-fiction is better than it has ever been! The past two years have shown some real leaps in the quality, showing how factual books can be engaging and interesting for all ages. Non fiction can be, and is, a brilliant way of encouraging children to read, I read non fiction for pleasure, and I know many many children that come to our library who do the same. A high percentage of which only choose non fiction books for their out of school reading. 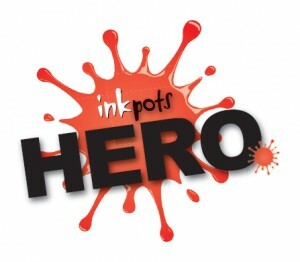 It is a genre which deserves much more recognition as a source of pleasurable reading for children and adults. I recently came across a publishing company called B Small Publishing, and they are producing excellent, interactive non-fiction for children. Three of which I’m going to look at today! First up is Real-Life Mysteries. Can you explain the unexplained? by Susan Martineau and Vicky Barker. I’m a huge fan of this book! It covers various topics including ghosts, UFOs, aliens, crop circles and much more. It’s exactly the kind of thing children and adults are mutually fascinated by. So we’re onto a great start with content choice. What really blows me away about this book though, is the fantastically conceptualised design and layout. Each subject begins with a story, so for example, the first sightings of Bigfoot. On the following page, the story is broken down into facts, on a noticeboard page spread. 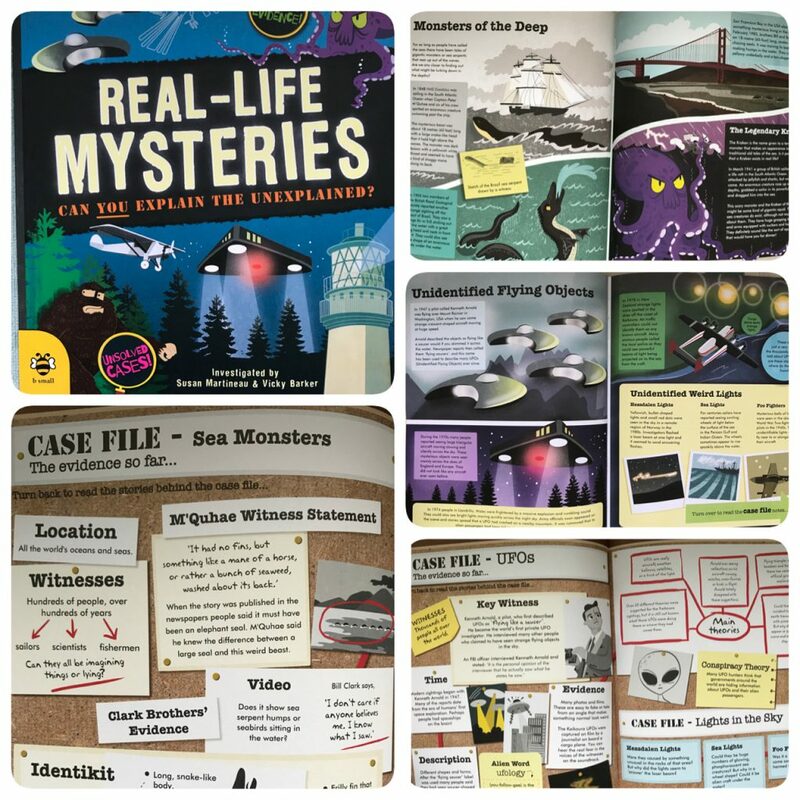 Not only does this look fabulous, breaks down the information into easily digestible bite sized chunks, but it’s a fantastic method of teaching children how to research and investigate topics. It teaches them about comprehension, and selecting the facts from a larger story, to find out as much as they can about something and come to their own conclusions. This is a really important skill for children, and it’s presented in a clear, highly visual and entertaining way. I have to say I also love the message on the back “just because something is written in a book does not mean it is true”. As a research tool, schools are now encouraging children to use books rather than the internet, which is very wise, but we need to still teach children the skills to be able to separate fact from fiction or myth. This book is packed with important lessons for children, not just regarding the subjects contained inside, but about investigation and research. 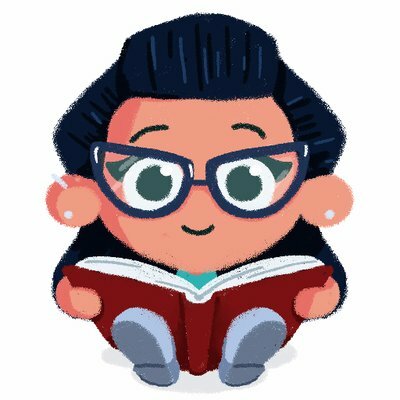 Vicky’s illustrations are full of personality, but not in an overly distracting way, they are perfectly pitched for the age group. Bright and bold, with character where it’s needed and clarity for the factual information. Susan’s writing is also well balanced with excitement and facts, written simply, but not patronisingly, it’s so brilliantly accessible for children. This fabulous book would be perfectly placed in a school or home environment for learning or fun! It slots into all aspects, and this is a keen example of the brilliance of well done non fiction! Real-Life Mysteries is available now from all good book shops and libraries. Next up from B Small Publishing are two books from The Histronauts series. 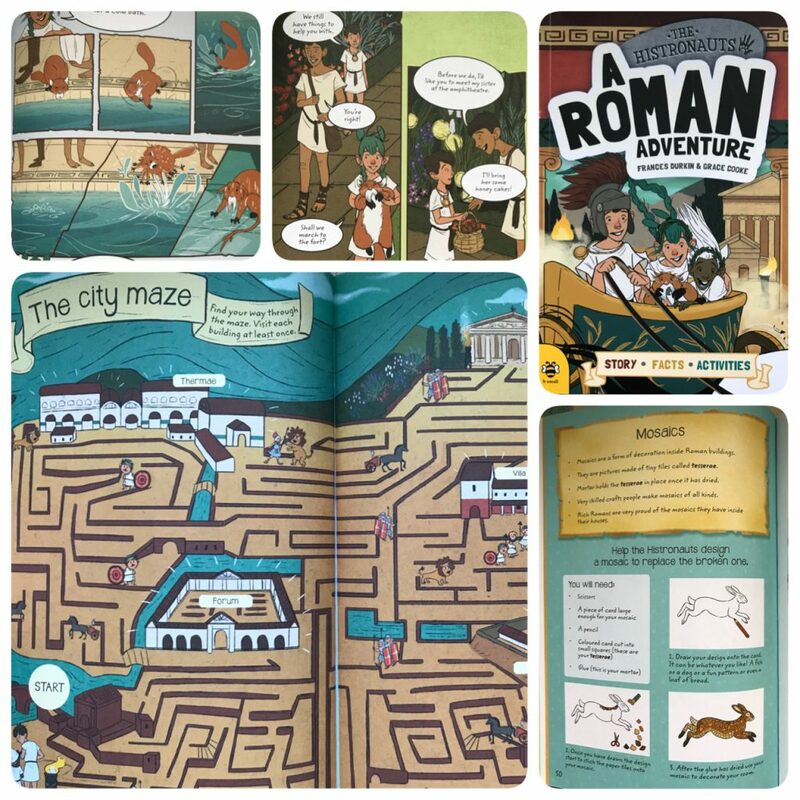 An Egyptian Adventure and A Roman Adventure by Frances Durkin and Grace Cooke. These non fiction books take on a much more graphic novel feel. The histronauts are modern day children, who get pulled back in time to the era of the book. So in these cases Egyptian and Roman times. Where they explore and investigate various aspects of the times. 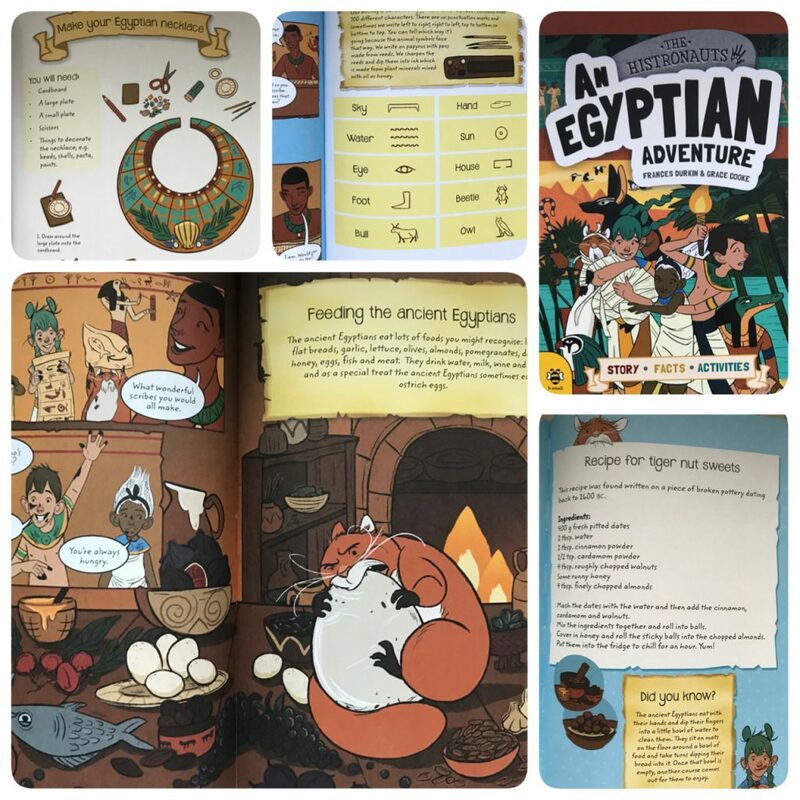 With the cartoon illustrations and speech bubbles, it feels like reading an adventure comic, with the same excitement and fun, yet these books are rammed with brilliant facts and information that children can learn from, presented in a variety of ways to engage children. I love that these books give facts and information, a storyline but most of all, recipes and craft activity ideas. 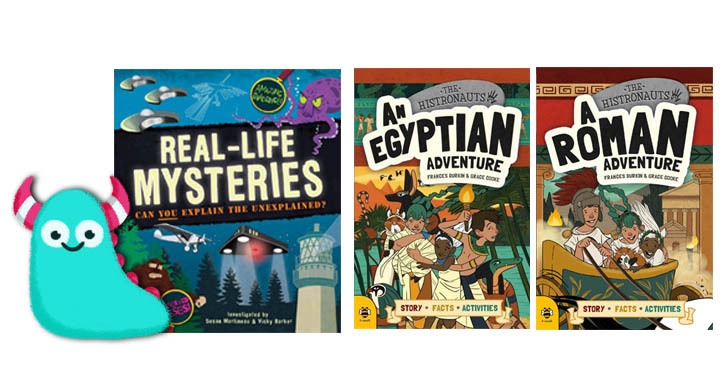 These books are about bringing history to life, helping children interact with it. The activities are simple and very doable in a home or school environment, but incredibly effective. I adore how all the information is presented in these books, no page looks the same, it’s all interactive, bright and colourful. Clearly a lot of thought has gone into the design of this series of books. I am particularly impressed by the quality of Grace Cooke’s illustrations here, they’re pitched just right, colourful and full of character making them endearing and attractive, but not too young or patronising at all. They’d sit very nicely in a high quality children’s graphic novel, and so it’s a treat to see them in a non-fiction setting like this. Frances Durkin’s writing is short and snappy and perfectly suited to the age range. These are wonderful books and I know many children who visit my library who would absolutely adore these. They are perfect for children just getting into reading, children who love non-fiction and children who want more from a book than just a simple novel. Who want to learn (yes many children actually do want and enjoy learning!) and want to get more activity from a book. This is why activity books and non-fiction go so perfectly together to make a book children want to read. The content covered within these unassuming, compact books is amazing, such is the clever design. In An Egyptian Adventure we have archaeology, sundials, markets, home life, hieroglyphics, Egyptian Gods, the afterlife and so much more. The information is packed in here, but in small, cleverly planned out and easily digestible chunks alongside activities to reinforce the details. A Roman Adventure covers Roman Gods, features of a Roman city, Latin words, Roman numerals, baths, home and even mosaics. Both books end in a little multiple choice quiz for children to test themselves on what they’ve been reading about. I know, from talking to parents, how many children enjoy quizzes at the end of books. It’s another interactive element giving these books value. The whole team involved in this series have done a superb job. Marrying together fiction and non-fiction in a way that allows children and their parents or carers to be able to pinpoint which is which, is tricky, but with The Histronauts series this has been accomplished incredibly well. I’m really very impressed. The Histronauts series are now available from all good book shops and libraries.